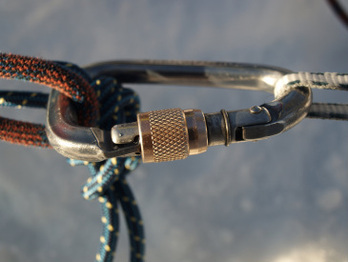 A carabiner is a tool that is widely used for climbing, sailing, construction and caving among other uses. It consists of a metal loop with a gate that is spring-loaded and is used to quickly and reversibly connect components in safety-critical systems. Through the years, the carabiner has been improved numerous times, making it more durable, lightweight, and reliable. In 1911, Otto Herzog became the first rock climber to use the carabiner for climbing. Later, in the 1970s a hollow design carabiner model was introduced. This new model weighed in at only 40 grams and was not only revolutionary because of the safety testing done on every single unit but also because of its form. All climbing carabiners today are crafted of solid metal.